PS. That piece of white paper in taped to the window says that they're currently hiring if anyone is interested. 6 Response to "1000 Words - Mix & Company"
It's a new venture started by the former owner of Jasmine Sola before it was purchased by New York and Company. There is a link in this blog post to more information about the new company. yeah i was wondering if there was a website to show what mix and company offers for clothes. I hope its the same stuff as jasmine sola cause a mix and company is opening in hingham at derby street where jasmine sola used to be. 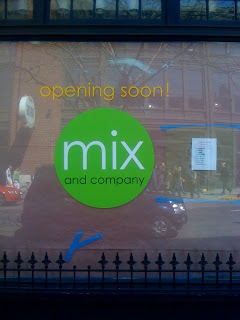 Mix and Company opened this weekend under a different name..344 Newbury. It looks like a knock off Jasmine Sola and the clothes look so cheap (even worse than Jasmine Sola towards the end). To make things worse I hear the same *itches that used to work there before are back again so Im taking my money somewhere else. Why bother!!!! As someone who works at the store and previously worked at Jasmine Sola since the opening, I can say that the clothes are of good quality and trendy. New York and Company brought in cheap clothes and overpriced them, 344 has the Jasmine boutique-feel to it. Oh, and I don't know what store you (anonymous) are going to, calling the associates "*itches" but my store thrives on customer service--so please, don't judge the company on one store,thanks!